Puppies are usually more expressive and their emotions may be easier to identify. The kitten is not always able to express the pain or some discomfort in the same way and when it is reserved by nature it becomes even more difficult. However, a stressed cat needs special attention and care not to get worse. But, how do you know if the cat is in trouble? Some signs report a stressed cat, no matter how quiet it is, just calmly watch and consult a veterinarian to check the pet’s health. In the same way that we humans are affected by stress and get out of control in some situations, the feline can also suffer from it. The tricky part of all this is that most cats tend to hide this inner turmoil and not everyone makes the feeling of agony clear. But it is important to be aware because a stress crisis can progress to a more serious illness and generate complications for the pet. 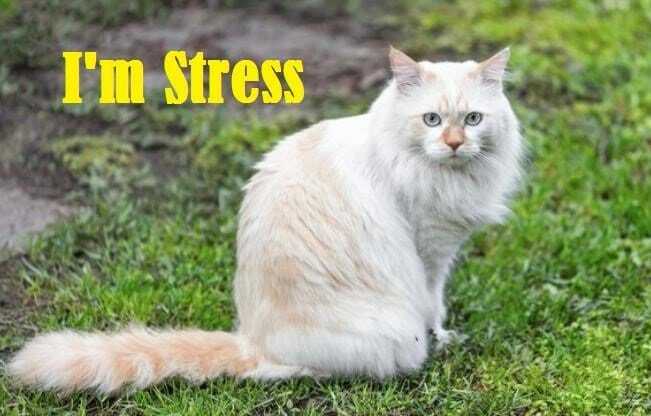 How to Identify a Stressed Cat? First, How to Identify a Stressed Cat is Pee in the wrong place, For it is not always the fact that the cat urinates out of the litter box is synonymous with revolt or disobedience. Usually, it is more a way to mark territory, in furniture and walls. In that case, consult a veterinarian and understand what to do to mitigate the situation. After all, this act is a way to get the owner’s attention and say “hey, I’m not well”. It is quite common and everyday cats lick themselves by taking the famous “cat bath”, but compulsively it can become a problem. Especially if there are wounds or faults in the coat of the legs. Likewise, scratching yourself non-stop all day long is a nuisance. Whether due to stress or skin diseases, it is necessary to understand what causes this process. Some cats are naturally more vocal than others, but the high and constant meowing is not positive – especially if accompanied by expressions of agony or panic. Do not try to silence the pet, it is best to call the doctor. When the feline is in this situation it is not uncommon to want to be quiet and without companies. It will become more apathetic and seem rather discouraged, but care must be redoubled so as not to escalate into depression. Do not force anything to avoid further irritation. He will probably also be always drowsy and lazy. If he is sleeping much more than he normally does, it is another alert. As said before, some pussies demonstrate bravado and irritation while others remain more reserved. However, if the cat wants to attack other animals, visitors or the family itself, one can be sure that something is wrong – especially if this behavior is not observed frequently. This aggressiveness appears through scratches, bristly loins, dilated pupils, and even bites. The lack of appetite and little interest in the meal deserve the attention of the tutor. It may simply be some gastrointestinal or other problem, but it must be vetoed. Diarrhea and even vomiting may appear and worsen the pet’s health condition. This can even lead to malnutrition, thinness, and need for nutrients. In addition, the fact that the cat swallows tissues or inedible objects also needs care and attention not to harm the stomach of the pet. My cat is stressed, now what? Natural tranquilizers are good options to relieve tension in kittens. But this should be checked with the vet, who will indicate the best treatment. Also, if the tutor has not given much attention to the pet or the animal has undergone some drastic change in recent times, stress is common. After all, moving from one environment to another may require a long adaptation. Always try to nurture it, feed it in the best possible way, stimulate it through play and receive tips from experts to help the stressed cat.